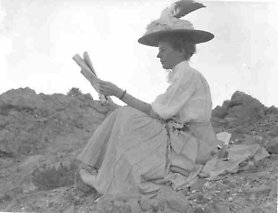 May Bradford Shockley was the first female in Nevada to be a U.S. Deputy Mineral Surveyor at a time when the profession was open only to men. She also became well known as an artist in her later life. Shockley’s experiences proved her to be a woman of great fortitude. May Bradford Shockley was born in Missouri, 1879. She graduated from high school in Missouri and attended Stanford University, where she studied art and mathematics. During her time at Stanford, her father moved to Tonopah and initiated a partnership with a surveyor to search for gold. Shockley graduated from Stanford and began teaching while caring for her ailing mother. In 1904, Shockley’s father found his business burned to the ground and his partner gone from the area. Shockley left her life as an educator to move to Tonopah to help her father. She entered into a partnership with her father and did some drafting on the side. Shockley enjoyed life in the small town and was said to be good with a gun. She had a natural talent as a surveyor and applied for the Deputy U.S. Mineral Surveyor position. She received the appointment in Nevada, and later in California. In 1906, Shockley and her father had grown weary of their lives and business in Tonopah. They closed their partnership and Shockley left for a tour of Europe. While in Europe she met a mining engineer, William H. Shockley. The two were married and moved to Tonopah. She pursued her love of art when she returned to Nevada and became a successful artist. May Bradford Shockley did not allow herself to be constrained by the gender roles of her time. She passed away in 1977. Source: Doughty, Nanelia S. “Tonpah’s Lady Surveyor.” The Nevadan, Las Vegas Review Journal. 30 November 1969.